I sometimes get sucked in by the packaging. Case in point: Blue Underground’s extras-packed, dual-format edition of Get Mean, a 1975 spaghetti western that, from the description on the Blu-ray case, self-consciously plays havoc with the genre. Of course, the spaghetti western itself is a self-conscious reworking of the classic American western, so this particular movie sounds very meta. In itself, that isn’t necessarily a bad thing. Tonino Valerii’s very meta My Name Is Nobody (1973) is one of my favourite westerns, spaghetti or straight. Ferdinando Baldi’s movie, produced by and starring Tony Anthony, has a nameless gunfighter hired in a dusty, almost deserted desert town to take a Spanish princess back home to reclaim her rightful place. The Spain he finds himself in is vaguely medieval, a land ravaged by conflicts between Moors and Vikings and barbarians. There’s even a villainous sidekick modeled on Shakespeare’s Richard III. Sounds like fun. I should have taken a quick look in Alex Cox’s book about the genre, 10,000 Ways to Die, before picking the disk up at HMV’s bankruptcy sale. He’s scathing about Baldi and Anthony and having watched the movie, I have to agree. Despite the potential for bending familiar genre tropes into strange new shapes, this movie reeks of creative laziness; the script just slaps a lot of incongruous bits and pieces together with no sense of narrative progression. Many scenes don’t even end before it jumps onto something else which has little if any connection to what came before. On top of which, Anthony has zero charisma – he reminded me of Burt Young on an off day – although he gives the impression that he thinks highly of his own cleverness. Although the cinematography of Mario Perino is effectively colourful (it’s his sole credit on IMDb), Get Mean is a tedious bore. I’m not surprised I hadn’t heard anything about it or Tony Anthony before. Burt Reynolds already had a fairly solid career when he starred in Joseph Sargent’s White Lightning (1973), but this was the movie which crystallized the image he would carry through much of his subsequent career – a good ol’ boy action star. But here at the beginning there’s no sign of the goofy comic element which coloured movies like Smokey and the Bandit and its sequels, Hooper, and The Cannonball Run and its sequel. 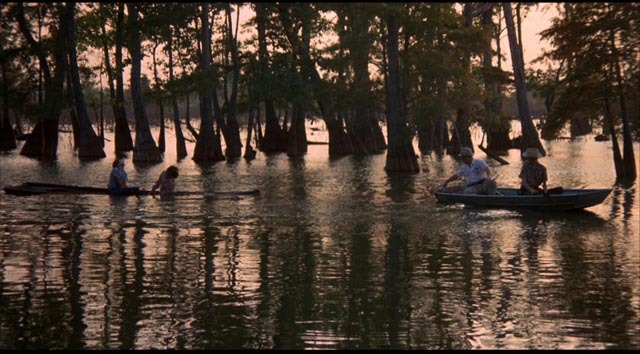 White Lightning is a fairly grim slice of Southern action, beginning with a haunting title scene which conjures up echoes of the violence committed a decade earlier during the Civil Rights movement; two kids are rowed out into a swamp by a couple of men and murdered by drowning. One of them turns out to be the younger brother of Gator McKluskey (Reynolds), who’s serving time for running illegal liquor. Gator is sprung from jail by the feds who want him to infiltrate the county’s moonshine industry and bring down the man in charge, who happens to be Sheriff J.C. Connors (Ned Beatty), who also happens to be the guy who murdered Gator’s kid brother. Looking for revenge, Gator uses whatever means necessary to get the job done, even if it means hurting those on the lower rungs as he makes his way up to Connors. Director Joseph Sargent plays the pulpy story straight, handling the action efficiently and getting strong performances from a cast of familiar supporting players (Matt Clark, Bo Hopkins, R.G. Armstrong, Dabs Greer, Diane Ladd and Louise Latham). Sargent had a very long and varied career, mostly in television, and White Lightning came in the middle of a very brief period when he did his best work in three features – Colossus: The Forbin Project (1970), this one, and The Taking of Pelham One Two Three (1974). Gator, the sequel which followed three years later, was directed by Reynolds himself, beginning a sporadic and generally undistinguished side career. Although written, like the previous movie, by William W. Norton, there’s no attempt to provide the character with any continuity. In White Lightning, Gator is estranged from his Ma and Pa (Iris Korn and Dabs Greer); in the sequel, he lives in a swamp shack with his Dad, Ned (John Steadman), and his tomboy daughter Suzie (Lori Futch). This newly invented alternate family signals a major shift in tone from the original movie. The comic banter between Gator and his kin is compounded by the introduction of a buffoonish federal agent from New York, Irving Greenfield (Jack Weston), who arrives in Georgia at the request of the governor (talkshow host Mike Douglas) to bring down Bama McCall (Jerry Reed), a violent crime boss who has taken over Dunston County. Greenfield tries to harness Gator, who knows Bama from way back, to help. Obviously, this is heading for Smokey and the Bandit territory; the action is bigger and more cartoonish, striving for a more comedic tone. Reynolds isn’t taking things as seriously as Sargent did, milking Weston’s New-York-Jew-out-of-water for obvious laughs. Any attempt to create some kind of realistic image of the South is swamped by cliches. Both movies get fairly decent transfers on Blu-ray from Kino Lorber, each accompanied by a brief interview featurette with Reynolds talking about their origins. Speaking of Joseph Sargent, I just re-watched The Taking of Pelham One Two Three (1974) on Blu-ray from Kino. This is a fine, gritty heist movie which makes the most of its New York setting and a great cast. As in all the best heist movies, the gang’s imaginative plan to extort money from the city by hijacking a subway train seems well-thought-out and foolproof … but tensions among the group derail things. Apart from the movie’s obvious strengths – a tightly constructed script by Peter Stone, based on John Godey’s novel; the raw, unglamorous cinematography of Owen Roizman (who had shot The French Connection and The Exorcist in the two previous years); the excellent cast headed by Walter Matthau, Robert Shaw, Martin Balsam, Jack Warden and others; and Sargent’s direction, which draws every ounce of character and narrative tension out of the story and locations – it also had an obvious influence on Quentin Tarantino, who appropriated the gang’s colour-coded aliases for Reservoir Dogs. Piers Haggard, like Sargent, had a long career mostly in television, and like Sargent, he directed a handful of projects which stand out from the rest. After five busy years directing TV episodes (and one feature which quickly dropped out of sight), Haggard made Blood on Satan’s Claw (1971), one of the finest British horror films of its time, steeped in period atmosphere which had an air of authenticity totally unlike Hammer’s costume dramas. This film belongs with those other examples of a darker, nastier, more psychologically disturbing strain of horror: Michael Reeves’ Witchfinder General (1968) and Michael Armstrong’s Mark of the Devil (1970). Despite the quality of Blood on Satan’s Claw, Haggard returned to television for the next nine years. His finest works in this period were Dennis Potter’s Pennies From Heaven (1978) and Nigel Kneale’s Quatermass (1979). With the release of a compressed version of the latter as the theatrical feature The Quatermass Conclusion, Haggard made a couple more attempts to crack features with little success, in both cases stepping in to salvage projects which had run into trouble. First was the dire Peter Sellers comedy The Fiendish Plot of Dr. Fu Manchu (1980), which began under the direction of Hollywood veteran Richard Quine. This was followed by Venom (1981), a thriller from which Tobe Hooper was fired after a week or two of shooting. Based on a novel by South African writer Alan Scholefield, this is the story of a kidnap attempt gone wrong. There are some interesting elements to the story, and also some absurd ones. Young Philip Hopkins (Lance Holcomb) lives in a nice house in London with his mother Ruth (Cornelia Sharpe) and grandfather, big game hunter Howard Anderson (Sterling Hayden). The asthmatic boy is smothered by his overly-concerned mother, while his grandfather strives to give him a bit more freedom. When Ruth leaves on a trip to meet up with her husband in Germany, Howard sends Philip off by taxi to visit the petshop which supplies him with exotic animals for the small menagerie he keeps upstairs in the house. This little trip is the first snag in the plot to kidnap him as his nanny, Louise Andrews (Susan George), is unable to contact her lover, the sinister Jacmel (Klaus Kinski), to warn him that the boy isn’t home. 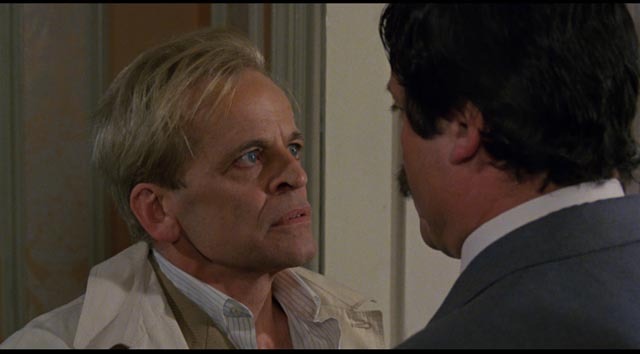 With their timing thrown off, the kidnappers – Jacmel, Louise, and the family chauffeur Dave (Oliver Reed) – end up trapped in the house with Philip and Howard as the police gather outside under the command of the unflappable Commander William Bulloch (Nicol Williamson). As the siege drags on, the tensions between the kidnappers become more intense. Jacmel is a cool-headed schemer, but Dave is a violent hothead; they despise each other (a plot point amplified by the fact that Reed and Kinski despised each other). All of this is well enough; although the script has the unadorned quality of a routine made-for-TV movie, the cast is exceptional and fun to watch. The problem is that Philip was inadvertently given the wrong pet at the pet shop. Instead of a harmless snake, he ended up with a black mamba (the deadliest, most aggressive snake in the world). And it gets loose in the house. 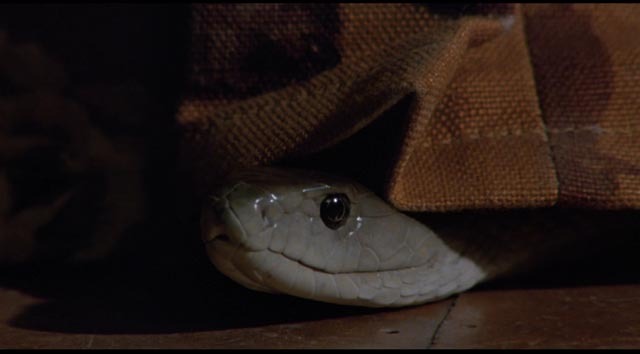 Intended to up the stakes, this plot gimmick instead injects a note of comic excess; the squabbles among the kidnappers are repeatedly interrupted by shots of the snake slithering around in the heating ducts, occasionally popping out like a reptilian jack-in-the-box for mechanical jump scares. The snake is simply one complication too many and the movie would probably be better if it just relied on the character conflicts. Blue Underground’s Blu-ray sports a nice-looking transfer and carries over Piers Haggard’s commentary from an earlier DVD edition. The latter is quite interesting as the director talks about the limitations imposed by taking over a production which is already well underway; there are things he would have done differently if he had been involved earlier. Which is not to say that he tries to make excuses for the film’s weaknesses (which he’s quite aware of); this was a job for hire and he did the best he could do under the circumstances. His most interesting comments are about the difficulties of working with strong-willed actors who disliked each other intensely. The movie is passably entertaining, but the behind the scenes story is more engaging than what’s up on screen. 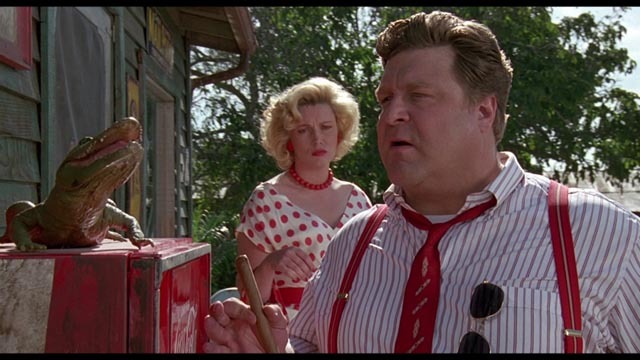 Gimmicky thrillers are at the heart of Joe Dante’s Matinee (1993). Dante is the movie geek par excellence, his films packed with references to his favourite movies. This gives much of his work the air of an extended in-joke, often taking the viewer out of the immediate story by calling attention to those other movies. Even at his best, this tendency mitigates the impact of the material. I love Piranha (1978) and The Howling (1981), but in both Dante’s comic tendencies compromise the effect of the narratives’ horror elements. But this is who Dante is, essentially a comedy director with a deep affection for horror and fantasy. In Charles S. Haas’ script, Dante found a vehicle which strikes a near-perfect balance between these two aspects of his personality. Matinee’s narrative is built on a solid foundation: the effect on a group of kids in Florida of the Cuban missile crisis unfolding offshore. The crisis is personal to Gene Loomis (Simon Fenton), whose father is in the Navy and engaged in the blockade. But while the fear and uncertainty of the international situation causes Gene emotional and psychological stress, he is dealing with average-kid issues – adjusting to a new school where he’s an outsider, attraction to a girl, Sandra (Lisa Jakub) – and the excitement of learning that his favourite movie-maker is coming to town to launch his new sci-fi/horror movie. 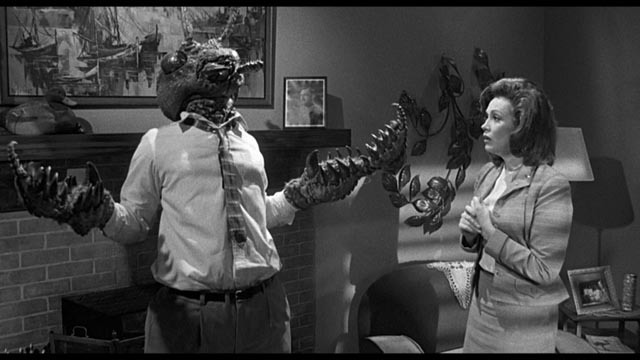 Mant is the work of the William Castle-like Lawrence Woolsey, a larger-than-life figure who puts more effort into promotional gimmicks than into his actual movies. 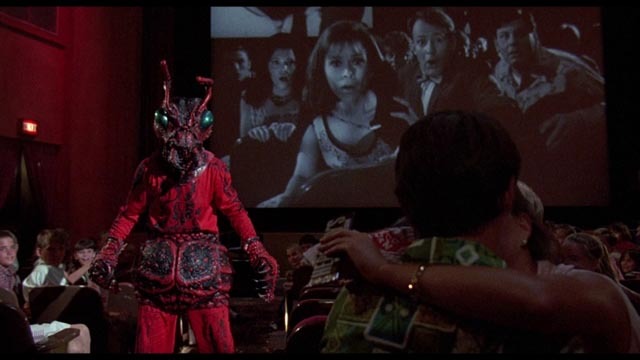 Gene becomes involved in Woolsey’s plans for the premiere and the two story threads converge on the screening, where the absurdities of the on-screen story (a man transformed by radiation into a giant insect) become amplified by the very real fears caused by the crisis; as the theatre itself collapses during the screening, the audience is convinced that nuclear Armageddon has arrived. Dante does a fine job balancing the affectionate comedy of his Castle tribute with the darker undertones of “real world” story within which the characters are caught up. At first glance, Mant might seem like an inappropriate pivot for the plot – it’s a movie which belongs to an earlier age, rooted in the atomic anxieties of the early ’50s – and yet even this seeming miscalculation works in Matinee’s favour; the absurd fears of this B-movie are indeed out-of-date and can’t help but fail as an outlet for the audience’s very real fears generated by the missile crisis. It’s not the movie itself that triggers audience panic, but rather the inadvertent destruction of the theatre caused by Woolsey’s promotional gimmicks gone wrong. Matinee is about the loss of innocence at the moment when real-life fears transcend the safe fears expressed in movies. Although Armageddon is averted at the last moment, an awareness of the possibility of total destruction makes the horrors of movies like Mant hopelessly ineffective. The publicity gimmick starts to go wrong at the premiere of Mant! Arrow’s Blu-ray has a very good transfer provided by Universal, along with a number of interviews (including a lengthy one in which Dante goes into detail about the history of the production) and production featurettes, including the “complete” Mant (16 minutes). It’s an excellent package for what is arguably Dante’s best film. This entry was posted in Commentary, Review and tagged Action, Actors, Blu-Ray, Comedy, Directors, Horror, Thrillers, Western. Bookmark the permalink.